Why should I blog anyway? Google likes to pay extra attention to sites that stay updated, so kill two birds with one stone! Don't be a stagnant, set-it-&-forget-it website. Those kinds of websites don't "work" for businesses anymore, especially if your business relies on people seeking you out, or finding you online in any capacity. Trust me, you want your site to do some "work" for you, so you have less to do yourself! Right? Write blog posts that help your readers learn something from each post, and by doing so, you're updating your website on a regular basis (telling Google you're still relevant!). You can post daily, weekly, biweekly, monthly; whatever schedule works best for you. Whichever you decide on though, stick to it and promote each post on your other platforms so people can find it! After a while, people will catch on to your routine, and if they want to follow along they'll come back to check for new posts. But if I blog to share what I know, aren't I giving it all away for free? The DIY-ers never planned to pay anyone to do it. They are scouring the internet for free places to figure out how to do it themselves. You were unlikely to sell to them anyway! So, if you want to reach that crowd regardless, help them by throwing out helpful tips on your blog, so they can learn from you, or create a course to put all that info in one place & teach them how to do it at a discounted price (for not working with you one-on-one). The non-DIY-ers never planned to learn how to do it, because they either have the capital to blow on paying someone else, or they don't have the time/motivation to learn how to do it. First, hopefully you already have a blog page. Go to that page in the backend of your Squarespace website, and click the + sign in the top right of the Blog menu, or press the space bar to get the pop up that adds a blog post to that page. If you don't already have a Blog page, that's okay. I'm walking you through that too, in the video directly below! Don't worry, getting started is super easy! I like to put my Blog page in my Not Linked area, because I have a separate Archives page that I designed and I use that one in my navigation. Your actual Blog page will have an icon that has a lowercase "a"
Don't forget to go back and add the necessary page title & description in the Blog Page Settings! That will tell Google what this new page consists of, and helps it categorize your site better. This is the Settings icon for pages. When you hover the link to that page in your Pages menu, or up in the right corner of the Blog Page menu when you're on that page. The 7 Steps to Create & Schedule your Squarespace Blog Posts. Give the New Post a Name! Click "Draft" near the bottom right, to Schedule the post & pick a date you want it to publish for you. Whether your post is published or not, you can always go back in & edit the contents. One thing I will note here, is that if you use this window to create your blog post, your styling will look a little odd. Don't worry, it won't look that way when Published. If you want to design your blog & see the styling correctly as you go, then just do the basics in this window, click Save, then go back & edit it on the preview page, as you're used to doing. That means, click on the blog post you want to edit in the left hand menu, then find & click the dark grey "Edit Page" button on the page preview side. Now you can edit the contents & see the styling as you go. For further blog options, click on the other tabs at the top of the Edit Post page. Content lets you create the title, body copy & imagery inside, tags, category, and other basic settings. Options lets you add the blog post thumbnail image, change/edit the URL for that blog post, add an excerpt if you want to use one, and more. Location isn't usually relevant for most bloggers, but if you're a travel blogger then you could list the location from where you're posting (for example). Social is where you can choose what outlets you want Squarespace to push the blog post to, when it Publishes. You can turn those on & off here. You can pick the month, day, year, time and AM or PM in this window. Once your done, click off of that little popup area, to make it disappear again. Now you'll see that it says, "Scheduled" and it will list the time & date you set it to Publish. 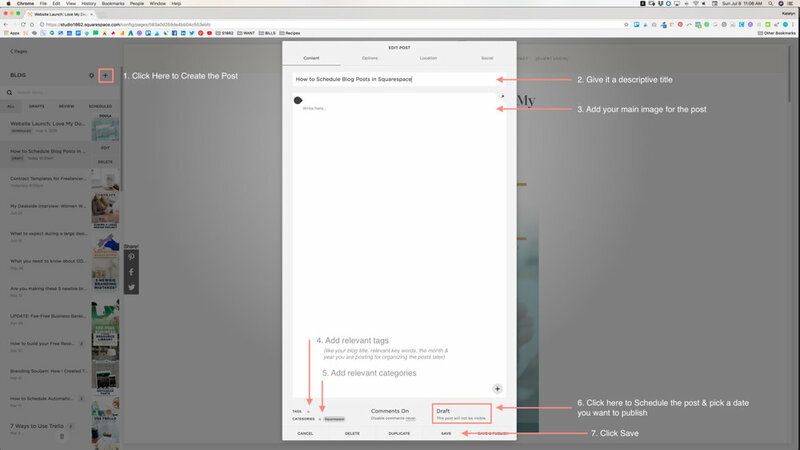 TIP: This same tutorial works for those who don't blog, but update a schedule/calendar on Squarespace instead. Like my friends over at SouljamBand.com; they keep up with a gig calendar and they can schedule those gig info posts, in the same way I schedule blog posts ahead of time. So for example, if they book a performance event 12 months from now, they can go ahead & create the event-related post & Squarespace can post it automatically, on a time/date they choose, that's closer to the actual event. Save yourself time & energy, and batch your blog posts. Use a whole day or two, or a week if you have it and plan ahead; write a few, schedule them ahead of time, and then you'll have some brain space cleared up! No more stress about when you'll have time to write one & post it, on the day it's due! Who has time for that anyway, right?! You've got enough to think about already! If you have a question or comment about this tutorial, please drop it below in the comments! I love reading them!